This short article provides brief accounts of Ibn Fadlan's observation on Scandinavia and a people he calls the Rus. His reports have become a great source for successive historians on a range of topics from Scandinavian history to regional religious traditions. The film "The 13th Warrior" was based on Ibn Fadlan's journey. Figure 1. 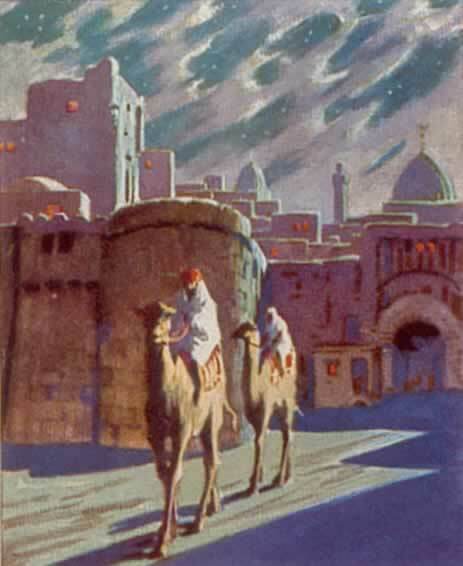 Ibn Fadlan travels at night from Astrakhan, (southern European) Russia (Image from http://www.jadu.de). There have been many Muslim accounts of Scandinavia, some of them quite early in time (in fact constituting the earliest and most extensive reports of that part of the world) with as many as 50 medieval Muslim writers making such descriptions. The best known description is that of Ibn Fadlan. Ibn Fadlan's description of Northern Europe, and Scandinavia, has been analysed and commented upon frequently and forms the substance of many observations on the study of the ethnography and sociology of the peoples concerned. It also has become the inspiration for the famous novelist Michael Crichton's Thirteenth Warrior which was later made into a film. In the tenth century Ibn Fadlan accompanied a mission from the Caliph al-Muqtadir to the Volga Bulgars. In his Rihla (travel narrative) he describes his experiences and the people and places he visited, i.e. the Khazzars, and on the manners and customs of the Rus. Ibn Fadlan describes very extensively the populations that live in the region, their trades, manners, clothing, diets, living, and also their customs, such as leaving a sick man alone under the tent with only bread and water, approached by none, waiting for him either to die or recover on his own. He also describes religious and other practices, such as the burning of a dead lord on a boat, and alongside him his female slaves. - and finally an extensive description of the cremation of a dead leader. - the fifth aspect inserted in the middle, and dealing with the length of the night is derived from al-Dahan's edition. Below are extracts from Ibn Fadlan's account. I saw the Rusiyyah when they had arrived on their trading expedition and had disembarked at the River Atil. I have never seen more perfect physiques than theirs—they are like palm trees, are fair and reddish, and do not wear the qurctaq or the caftan. The man wears a cloak with which he covers one half of his body, leaving one of his arms uncovered. Every one of them carries an axe, a sword and a dagger and is never without all of that which we have mentioned. Their swords are of the Frankish variety, with broad, ridged blades. Each man, from the tip of his toes to his neck, is covered in dark-green lines, pictures and such like. Each woman has, on her breast, a small disc, tied around her neck, made of either iron, silver, copper or gold, in relation to her husband's financial and social worth. Each disc has a ring to which a dagger is attached, also lying on her breast. Around their necks they wear bands of gold and silver. Whenever a man's wealth reaches ten thousand dirhams, he has a band made for his wife; if it reaches twenty thousand dirhams, he has two bands made for her—for every ten thousand more, he gives another band to his wife. Sometimes one woman may wear many bands around her neck. The jewellery which they prize the most is the dark-green ceramic beads which they have aboard their boats and which they value very highly: they purchase beads for a dirham a piece and string them together as necklaces for their wives. Figure 2. 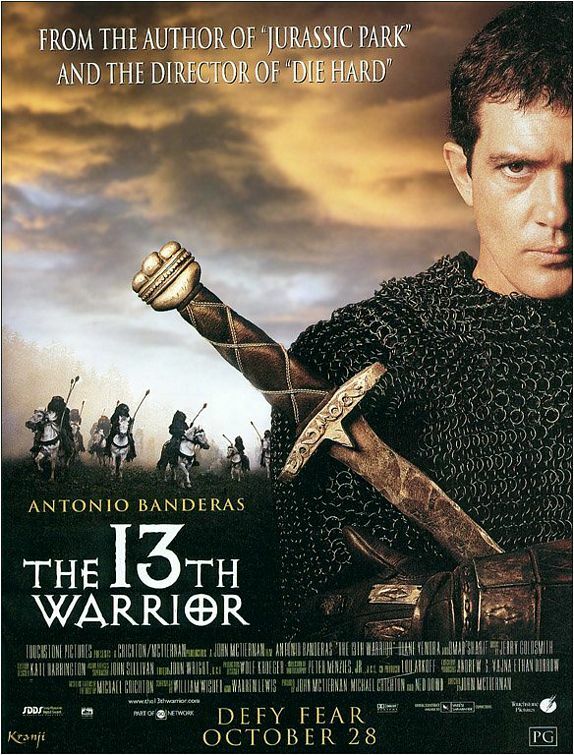 A movie poster of the 13th Warrior (Image from: http://www.impawards.com). They are the filthiest of all Allah's creatures: they do not clean themselves after excreting or urinating or wash themselves when in a state of ritual impurity (i.e., after coitus) and do not even wash their hands after food. Indeed they are like asses that roam in the fields. They arrive from their territory (min baladi-him) and moor their boats by the Atil (a large river), building on its banks large wooden houses. They gather in the one house in their tens and twenties, sometimes more, sometimes less. Each of them has a couch on which he sits. They are accompanied by beautiful slave girls for trading. They cannot, of course, avoid washing their faces and their heads each day, which they do with the filthiest and most polluted water imaginable. I shall explain. Every day the slave-girl arrives in the morning with a large basin containing water, which she hands to her owner. He washes his hands and his face and his hair in the water, then he dips his comb in the water and brushes his hair, blows his nose and spits in the basin. There is no filthy impurity which he will not do in this water. When he no longer requires it, the slave-girl takes the basin to the man beside him and he goes through the same routine as his friend. She continues to carry it from one man to the next until she has gone round everyone in the house, with each of them blowing his nose and spitting, washing his face and hair in the basin. The moment their boats reach this dock every one of them disembarks, carrying bread, meat, onions, milk and alcohol, and goes to a tall piece of wood set up in the ground. This piece of wood has a face like the face of a man and is surrounded by small figurines behind which are long pieces of wood set up in the ground. When he reaches the large figure, he prostrates himself before it and says, "Lord, I have come from a distant land, bringing so many slave-girls at such and such per head and so many sables at such and such per pelt." He continues until he has mentioned all of the merchandise he has brought with him, then says, "And I have brought this offering," leaving what he has brought with him in front of the piece of wood, saying, "I wish you to provide me with a merchant who has many dinars and dirhams and who will buy from me whatever I want to sell without haggling over the price I fix." Then he departs. If he has difficulty in selling his goods and he has to remain too many days, he returns with a second and third offering. If his wishes prove to be impossible he brings an offering to every single one of those figurines and seeks its intercession, saying, "These are the wives, daughters and sons of our Lord." He goes up to each figurine in turn and questions it, begging its intercession and grovelling before it. Sometimes business is good and he makes a quick sell, at which point he will say, "My Lord has satisfied my request, so I am required to recompense him." He procures a number of sheep or cows and slaughters them, donating a portion of the meat to charity and taking the rest and casting it before the large piece of wood and the small ones around it. He ties the heads of the cows or the sheep to that piece of wood set up in the ground. At night, the dogs come and eat it all, but the man who has done all this will say, "My Lord is pleased with me and has eaten my offering." Describing the extremely short nights as a wonder of the land of the Slavs, Ibn Fadlan says that while he was waiting for the call to the late night prayers and talking to a tailor from Baghdad, he heard the call to prayers, and when he came out of the qubba it was morning. He had talked for less than half an hour. On asking the caller, he found it was a call for the morning prayers, and that the late night prayers were combined with the evening prayers (Maghrib). The nights were shorter than even this. It was so short that if a man put a cooking pot on the fire at sunset, and then offered morning prayers, the pot did not boil even then. Ibn Fadlan says, he found the day was extremely long and the night short for a duration in the year; then the night was long and the day short. The following night, he sat outside the qubba watching the sky, and he did not see except few stars, perhaps fifteen spread over, and even when the horizon was red before sun set, they did not disappear. As the night was not so dark, a man could recognise another man from a distance of an arrow throw. He saw the moon not crossing the middle of the sky, but appeared in its neighbourhood for an hour and then it was morning and the moon disappeared. The king with whom Ibn Fadlan had an audience told him that on the other side (north) of his country, at a distance of 3 months' journey, there were people called wisu, whose night was less than an hour. Again, at sunrise, the earth and the mountains, and everything glowed in red, until the sky became dark. The inhabitants informed him that in winter, the night stayed throughout the length of the day and the day stayed throughout the short period of the night, so much so that if a man went out at sunrise to Itil (Volga), a place less than one farsakh (3 miles from here), he did not reach it until the night prayers, when all the stars were out. So, he did not leave the country until the nights were long and the days short. Figure 3. 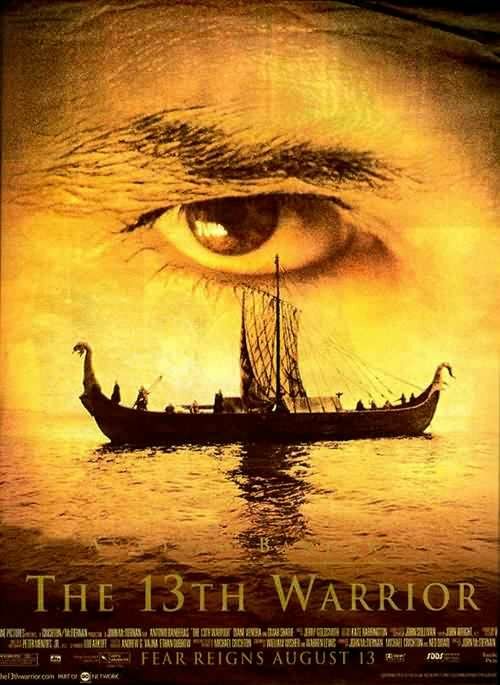 A movie poster of the 13th Warrior (Image from: http://www.impawards.com). Ibn Fadlan continues: “When one of them falls ill, they erect a tent away from them and cast him into it, giving him some bread and water. They do not come near him or speak to him, indeed they have no contact with him for the duration of his illness, especially if he is socially inferior or is a slave. If he recovers and gets back to his feet, he rejoins them. If he dies, they bury him, though if he was a slave they leave him there as food for the dogs and the birds. If they catch a thief or a bandit, they bring him to a large tree and tie a strong rope around his neck. They tie it to the tree and leave him hanging there until the rope breaks, rotted away by exposure to the rain and the wind. I was told that when their chieftains die, the least they do is to cremate them. I was very keen to verify this, when I learned of the death of one of their great men. They placed him in his grave and erected a canopy over it for ten days, until they had finished making and sewing his funeral garments. In the case of a poor man they build a small boat, place him inside and burn it. In the case of a rich man, they gather together his possessions and divide them into three, one third for his family, one third to use for his funeral garments, and one third with which they purchase alcohol which they drink on the day when his slave-girl kills herself and is cremated together with her master. (They are addicted to alcohol, which they drink night and day. Sometimes one of them dies with the cup still in his hand). When their chieftain dies, his family ask his slave-girls and slave-boys, "Who among you will die with him?" and some of them reply, "I shall." Having said this, it becomes incumbent upon the person and it is impossible ever to turn back. Should that person try to, he is not permitted to do so. It is usually slave-girls who make this offer. When that man whom I mentioned earlier died, they said to his slave-girls, "Who will die with him?" and one of them said, "I shall." So they placed two slave-girls in charge of her to take care of her and accompany her wherever she went, even to the point of occasionally washing her feet with their own hands. They set about attending to the dead man, preparing his clothes for him and setting right all he needed. Every day the slave-girl would drink alcohol and would sing merrily and cheerfully. Then the deceased's next of kin approached and took hold of a piece of wood and set fire to it. He ignited the wood that had been set up under the ship after they had placed the slave-girl whom they had killed beside her master. Then the people came forward with sticks and firewood. Each one carried a stick the end of which he had set fire to and which he threw on top of the wood. The wood caught fire, and then the ship, the pavilion, the man, the slave-girl and all it contained. A dreadful wind arose and the flames leapt higher and blazed fiercely. One of the Rusiyyah stood beside me and I heard him speaking to my interpreter. I quizzed him about what he had said, and he replied, "He said, ‘You Arabs are a foolish lot!'" So I said, "Why is that?" and he replied, "Because you purposely take those who are dearest to you and whom you hold in highest esteem and throw them under the earth, where they are eaten by the earth, by vermin and by worms, whereas we burn them in the fire there and then, so that they enter Paradise immediately." Then he laughed loud and long. I quizzed him about that (i.e., the entry into Paradise) and he said, "Because of the love which my Lord feels for him. He has sent the wind to take him away within an hour." Actually, it took scarcely an hour for the ship, the firewood, the slave-girl and her master to be burnt to a fine ash. They built something like a round hillock over the ship, which they had pulled out of the water, and placed in the middle of it a large piece of birch on which they wrote the name of the man and the name of the King of the Rus. Then they left. James E. Montgomery. "Ibn Fadlan and the Rusiyyah", Journal of Arabic and Islamic Studies, edited by Joseph Norment Bell, volume III, 2000.